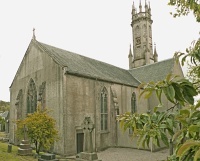 In 1891 John Honeyman & Keppie extended the nave of Rhu Parish Church, a Gothic Revival building dating from 1851 by William Spence (c. 1806–1883). The extension is square-ended and aisleless, with Decorated window tracery to match Spence's original building. The harled walls have stone dressings. The most distinctive features are the gently sloping buttresses, which only have set-offs at the top. Later additions have been made on both sides of the nave. Alternative names: Rhu Parish Church.